This is the second in a short series of blog posts covering my stock screen and investment strategy updates for 2019 and beyond. Note: This post covers an update to my Growth Rate metric. If you’re not familiar with it then here’s a link to the original blog post from 2013. And here’s a link to the related and updated Company Analysis Spreadsheet (XLS). The first change I made for 2019 and beyond was to switch from using adjusted earnings to reported earnings in all my various metrics. It’s a problem because reported earnings are often much more volatile than adjusted earnings, which makes it harder to get a sensible number for reported earnings growth. For example, imagine a company which has reported annual earnings over a five-year period of £100m, £200m, £50m, £120m and £80m. What is that company’s earnings growth rate? Is it minus 20% over the five years, since earnings dropped from £100m to £80m? Perhaps, but then again perhaps the £80m was an unusually poor year and isn’t reflective of what the company could do in a good year. Using a moving average of earnings is be better, but it can still be heavily impacted if a company reports exceptionally high or low earnings. That’s why my Growth Rate metric also includes revenue growth and dividend growth; they’re just so much more stable than reported earnings (the volatility of reported earnings is why I originally focused on adjusted earnings). But now I’m switching from adjusted to reported earnings in all my metrics because adjusted earnings have their own problems. So I need to find some other aspect of a company that I can measure, which is more stable than earnings and yet still has a close relationship to the company’s ‘earnings power’, i.e. its ability to generate earnings under normal conditions. And my chosen replacement is capital employed. It’s the raw material with which companies buy factories, machinery, trade marks, stock and other productive assets. And if a company, say, doubles its capital employed (by investing additional retained earnings and/or debt into productive assets) and is able to maintain its return on capital employed, then it will double its earnings. So a company’s potential earnings are closely related to its capital employed and yet, on a year to year basis, capital employed is extremely stable, at least most of the time. And that makes measuring its growth rate relatively easy. I wrote about this before Christmas where I said I would be measuring tangible capital employed growth, but upon further reflection I’ve now changed my mind. Instead, I’ll be focusing on capital employed including intangibles. I want to see a decent rate of return on all the capital employed within the business, including goodwill, trademarks, patents, computer software or any other intangible assets. The old Growth Rate metric for banks and insurers was slightly different because their operating model is different. 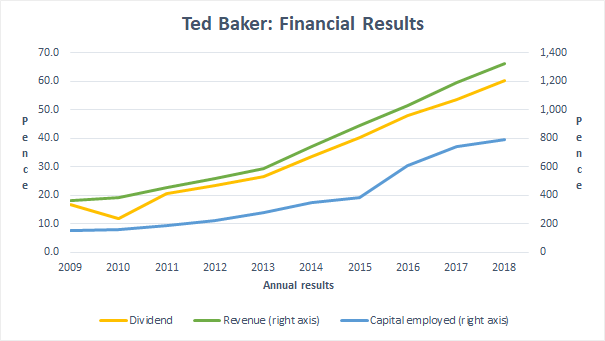 Instead of measuring revenue, adjusted earnings and dividend growth, the old financial company Growth Rate measured net asset growth, adjusted earnings growth and dividend growth. The reason is that financial companies don’t have ‘revenues’ as such, so I chose net assets (shareholder equity) instead. Now that adjusted earnings are being replaced with capital employed in the standard Growth Rate metric, I can’t do the same for the financial company version. That’s because financial companies don’t usually have much in the way of operational borrowings, so their capital employed (shareholder equity plus total borrowings) is very similar to their net assets (shareholder equity). So instead of replacing adjusted earnings with capital employed, for banks and insurers I’ll be replacing them with total assets (more accurately, net assets are used instead of capital employed, and total assets are used instead of revenues). As well as being closely related to a company’s earnings power, total assets are also very stable year to year, especially when compared to reported earnings. And that makes measuring total asset growth relatively easy. The next post in this series will look at changes to my Profitability metric. I was getting a bit confused. I remember Capital Employed =Working Capital + Fixed Assets= Total Assets – Current Liabilities = Equity + Noncurrent Liabilities. So Capital Employed= total assets – total liabilities+ total borrowings? Sorry, I am not so good at these calculations. just wanted to know of I have understood correctly. If we assume that all non-current liabilities are borrowings (which isn’t true, but is usually close to the truth) then the difference between 1 and 2 is that 1 doesn’t add current borrowings. The book Accounts Demystified has a good section on calculating capital employed and analysing returns on capital employed. I do have the book Accounts Demystified in my shelf, But yet to read it. The idea is that earnings are produced from capital employed, and in a ‘good’ company growth in capital employed should drive earnings growth. Also, capital employed is a much more stable figure than earnings so it’s much easier to see the ‘underlying’ growth of a company without all that earnings volatility. As for additional capital raised from shareholders, I’m measuring capital employed per share growth, so if capital is raised via a rights issue it will increase capital employed and also the number of shares. The net effect will depend on the rights issue’s offer price, but it won’t simply be a case of seeing capital employed (per share) increase. In most cases, capital employed will increase because of retained earnings and increased debts. In terms of increased debts, a higher Debt Ratio (Debt to 10yr avg earnings) is a negative, so increasing capital employed (a positive) would be offset to some degree by the increasing Debt Ratio (a negative). Again, the exact outcome would depend on the specific case, but growing capital employed by raising debt would not be a one-way good thing. Hopefully I’ve written that in a way that makes sense? As for not paying dividends, earnings not paid out as dividends are retailed, and retained earnings will increase capital employed. If ROCE is above 10% then my assumption is that those retained earnings are being invested by management on my behalf for a 10% (or so) return, which will lead to higher earnings and dividends in future. And that’s fine by me. ROCE will only be depressed if the company retains earnings and grows capital employed but isn’t able to use that larger capital base to drive higher revenues and earnings. That’s more of a potential problem for any company and I don’t think it undermines the idea of measuring capital employed per share growth instead of earnings per share. Feel free to poke more holes in the idea though. If an idea can’t withstand a bit of criticism then it deserves to go in the bin. What surely has to be watched is the different way that existing capital employed (say cash) is used. 1. Building a factory costing £10 million. or 2. Buying a company for £10 million whose sole asset is a factory in its books at £10 million. or 3. Buying a company for £10 million whose sole assets is a factory in its books at £1 million. Years ago there was no problem. Then the rules changed and goodwill got written out of the books immediately so that capital employed was meaningless. Now the rules have been changed back but I am not clear on the effect of different rates of depreciation or amortization in the above example..
Or do i worry too much and is it no problem? Goodwill is on longer amortised, instead it’s evaluated and revalued on a regular (typically annual) basis. Property, on the other hand, might be depreciated at some rate or other, given that factories do actually wear out over time and don’t have an indefinite useful lifetime. However, some buildings last a very long time (centuries) and they may or may not be revalued at certain points in time. If a property isn’t revalued, then it will be recorded at cost and if it was purchased decades ago then of course it doesn’t represent the current value of the property, but it does reflect the capital required to buy the property in the first place. In most cases these things don’t really matter from an investment point of view, but occasionally they do, especially when large acquisitions were made many years ago (as there can be a big difference between return on capital in those cases depending on whether you include the intangible goodwill or not). It’s not something I really worry about, but I do keep an eye out for large goodwill assets. And when I find them, I try to understand them and how they may be masking the true returns of the business.